Since centuries our saints, sages and seers have been using crystals- filled with divine power and brightness in various ways to enhance their life energies and to protect themselves from negative thoughts, atmosphere and ailments (diseases). A crystal was always a mysterious or an extraordinary item for the common man and they were not able to derive its benefits but in recent times intensive scientific researches and innumerable experiments conducted by mystical research specialists have effectively revealed its healing powers and its effect on body, mind and soul. That is why crystal therapy is spreading as an alternative therapy. In ancient times, people (of) nearly 30,000 years ago recognized its magical qualities and they used it for curing the problems of its people (populace). People, belonging to the famous civilization- ATLANTIS had a huge quart crystal which 25 feet long and 10 feet wide and the ailments of its people were cured by utilizing its energy field. This natural ninth faceted item is made from the combination of two natural elements- Oxygen and silicon. A natural crystal is formed when both these elements combine together in the earth’s crust due to excessive heat and immense pressure. It takes several centuries in the making of a natural crystal. A medical practitioner treats the physical ailments of the human body. A psychologist cures the human mind and emotions while a spiritual person treats the human soul, but the person giving treatment should do so by balancing all the 3 aspects viz body, mind and emotions because man is a balanced combination of all these 3 factors. The human body is a chain of energy systems and when some object prevents any part of the body from receiving this energy or puts some obstacles in its way then that part gets weak and it sends signals to the brain to provide for more energy. If the brain listens heads to its request then it transmits whatever sufficient energy it has in it to the affected part and that part again starts functioning properly. Otherwise the body or the affected part falls ill. In other words, soul energy is the essence of the human body. The crystal does the task of transforming various types of energies into living energies and does the work of its expansion as a result of which our living energy regains power and gets balanced. A crystal multiplies the life energy by several times by developing the resistance power in the body because of which our internal capacity of fighting diseases gets strengthened. The natural energy of a quartz crystal not only puts a great effect on your body but even leaves a great impact on your mind and emotions. In fact, a crystal increases our visualization power. Its effect falls on our computer like brain hence positive energy is circulated in the body after removing the negative energy present in the mind. Along with the mind and emotions (soul) a crystal develops their working capacity by balancing all the seven cycles of the body. A crystal increases the powerful field of energy surrounding the person by approximately a hundred feet. This negates the effect of several negative thoughts sent by others. After its use, no harm is caused even if on enters rooms of the sick where strong negative thoughts exist. A unique quality of the quart crystal is that it imbibes thoughts and beliefs in itself. Each crystal has a different wave length or vibration of its own. The energy coming out of a bright, clear and pure crystal is immediately absorbed by the living universe. This energy is not only affected by the living but also affects it. It is because of this uniqueness that it works like an efficient nature cure. As soon as it comes in contact with a living being, flora and fauna or the atmosphere it multiplies the life energy in that being by several times, which can effectively be proved by cilivion photography or through a pendulum, crystals can transmit the mind energy to the designated destination where it can be transformed into body energy. Alpha rays in abundant quantity are radiated when a quartz crystal is held in the hand or when it comes in contact with any part of the body. In order to enjoy the induction of your imagination power into the crystal your mind and brain begin to work on the frequency of Alfa Rays. Alfa, is that psychological state of the mind on which the capacity of accepting the suggestion from the computer of the unconscious mind begins .On this level only, the pace of the process of treatment is increased through right suggestions by removing the old harmful program. Applying crystal therapy alongside medicines and surgery helps the patient to recover faster in a shorter pace of time. It has not adverse effects. A clear, transparent quartz crystal performs the unique feat of imbibing the rainbow like rays of light in itself and transmitting them. Crystals of different colors like red, green, blue, amethyst, clear (transparent) etc; are used for the treatment of different types of patients. Green crystal for the physical body, light pink one for the sentimental body, blue sodalite crystal (Rose quartz) for the mental treatment and amethyst crystal for the spiritual treatment of the body are use. 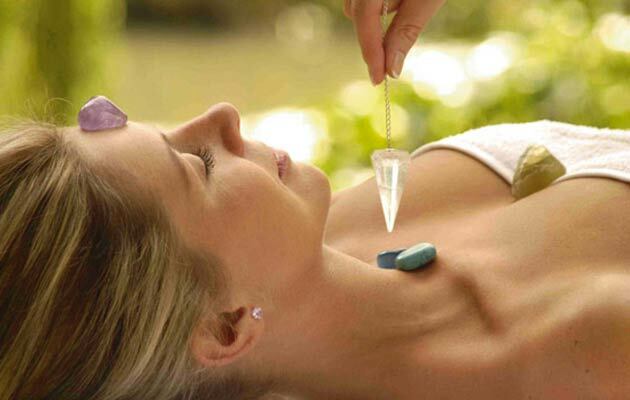 Their use can be made in several forms as per one’s convenience like in the form of a chain pendant, crystal chakra, shriyantra, statues, crystal balls etc; Usage of a crystal pendant or a chain having crystals on the heart cycle increases the resistance power of the patient because it strengthens the thymus gland. Its use can be made in the atmosphere around us and its energy power be increased e.g. by either placing it on the office table or putting it near the patient’s bed or underneath the pillow. Thus, we can say that this invaluable safety guard of the all powerful nature provides health gain by removing the weaviness of the body and the mind and pacifying the mind, it ailments and spate of emotions. It also enhances one’s personality by providing self confidence and fearlessness and also helps in one’s spiritual development.